, the ship-formed structure is really three freestanding pavilions across a narrow water channel under a single arching sail-shaped glass roof, allowing much of the interior to be lit by natural light. The palette of glass, steel and wood emphasize the simplicity and essentialism of Norwegian design principles. Temporary exhibitions and art workshops for children are on offer all year round. Signature artwork by Jeff Koons, Takashi Murakami, Damien Hirst, Cindy Sherman, Richard Prince and many others is exhibited at Astrup Fearnley. The Museums neighbourhood is a mix of art galleries, retail shops and residentials. The immediate neighbour is a designer hotel also committed to contemporary art: The Thief. The Bjørvika area encompasses the waterfront around the Norwegian Opera and Ballet. A former industrial area of railway lines, shipping containers and a busy motorway is being redeveloped into a huge pedestrian space, destined to become the cultural centre of Oslo. 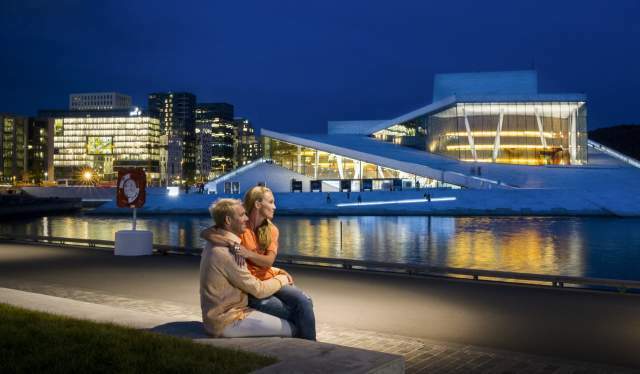 The gentle slope of the Opera’s roof has become a popular and attractive meeting place where visitors get the feeling of sitting on a white marble beach lapped by the Oslo fjord. In 2020, the present Munch Museum will be replaced by an ultra-modern 13-storey tall Munch universe in Bjørvika with artwork from all the different stages of his career (including The Scream), several exhibition areas, and workshops. The area is evolving rapidly, and at full completion in 2025, it will also include apartments, offices and several urban parks. Contemporary urban development is not limited to Bjørvika. The architectural momentum is conveyed in the Barcode buildings in Dronning Eufemias gate near the central railway sidings.
. In between the ground-level spaces is a sheltered public passage, and sculptures are displayed in open areas. Like modern art, the Barcode buildings divide opinion. The impact of the buildings vary depending on where you stand and at what time of the day. The Sørenga peninsula is part of the harbour area and falls within the larger Bjørvika development area. This is a new and central neighbourhood complete with parks and a pier that floats on the Oslo Fjord. Designed to make full use of the fjord, Norway’s first outdoor seawater swimming facility is incorporated into the Sørenga promenade. At the once industry-heavy bank of the river Akerselva, Vulkan is one of Oslo’s most interesting new city development projects. Mathallen’s attraction is that community and culture come together under the common association of food. Mathallen has a distinctive European market-hall feel with restaurants, cafes, greengrocers, pubs, bakers and fishmongers. Producers of Norwegian homegrown meats, cheeses, seafood and many more delicious foods and drinks are here to tempt your taste buds with the mouth-watering food choices Norway has to offer. From Mathallen you can cross the bridge over the Akerselva river and visit Smelteverket, a gastropub with Scandinavia’s longest bar and 20 large windows facing the river. Smelteverket’s soulful fusion-sharing menu offers a fascinating variety of tapas-style food. The ever-changing beer menu is always packed with great craft beers from around the world. Situated near the Ekebergrestauranten, the Ekeberg Sculpture Park is your opportunity to relax and enjoy the peace and quiet whilst taking in some culture or savouring a good meal. artists and lies on a small hill just to the south-east of Oslo city centre. Oslo has a lot to offer, so start exploring these listings to find even more things to do. ​Get in-depth travel information on Oslo’s official website.